This event will take place on October 3, 2014 in Calgary Alberta. The forum aims to bring together parliamentarians, experts and the public, to continue our dialogue on renewable energy and clean technology in Canada, and how it can be harnessed to create green jobs, foster sustainable growth and protect our environment. Ed Norrena, EDGE Environmental Consulting Ltd. Please note that space is limited at the event venue. 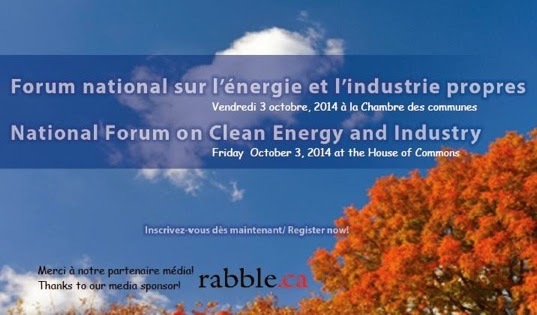 RSVP by September 26th to Isabelle Bourassa by email AnneMinh-Thu.Quach.A1@parl.gc.